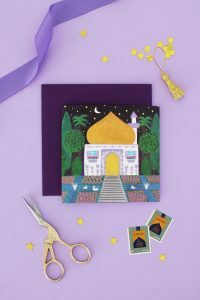 Eid Money Sponge Stamp Bags – Hello Holy Days! Sponge stamp drawstring bags as a great way to hand out money to children on Eid day. Have kids help with making the bags beforehand and then on Eid day, fill up each bag with money and treats. Thoughtful favours like small bottles of bubbles, mini notebooks or jewelry also fit snuggly into the bags. Pour paint into small paper plates and dip sponges being sure to thoroughly, but not excessively, coat the sponge. 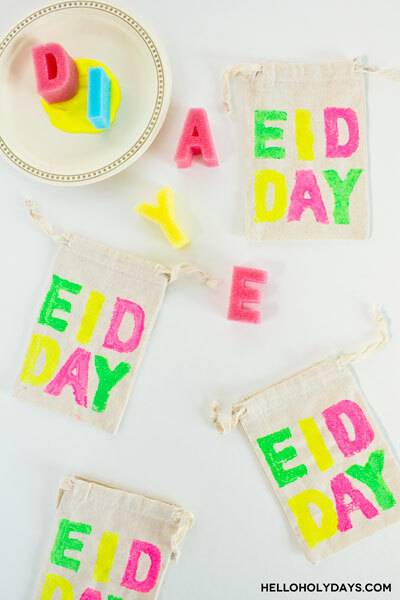 Stamp the phrase “Eid Day” onto bags using sponges.